The modern English name of the bird is derived from the Latin term aquila by way of the French Aigle. The Latin aquila may derive from the word aquilus, meaning dark-colored, swarthy, or blackish, as a description of the eagle's plumage; or from Aquilo, the Latin version of Greek Boreas, or north wind. Old English used the term Earn, related to Scandinavia's Ørn. The etymology of this word is related to Greek ornos, literally meaning "bird". In this sense, the Eagle is the Bird with a capital B.
Eagles are large birds of prey which inhabit mainly the Old World, with only two species (the Bald Eagle and Golden Eagle) found in North America north of Mexico, a few in Middle and South America, two (the White-bellied Sea Eagle and Wedge-tailed Eagle) in Australia, and the Philippine Eagle in the Philippines. They are members of the bird order Falconiformes (or Accipitriformes, according to alternative classification schemes), family Accipitridae, and belong to several genera which are not necessarily closely related to each other. Eagles are differentiated from other broad-winged birds of prey mainly by their larger size, more powerful build, and heavier head and bill. Even the smallest eagles, like the Booted Eagle (which is comparable in size to a Common Buzzard or Red-tailed Hawk), have relatively longer and more evenly broad wings, and more direct, faster flight. Most eagles are larger than any other raptors apart from the vultures. Eagles are sometimes used in falconry. They appear prominently in myth and literature. In the Old World, such references are commonly to the Golden Eagle (or possibly closely related species found in warm climates). + Crested Eagle, Morphnus guianensis The powerful Harpy Eagle can easily grab a monkey weighing 5 kg and fly away with it. The powerful Harpy Eagle can easily grab a monkey weighing 5 kg and fly away with it. + African Hawk Eagle, H. spilogaster A Steppe Eagle in Lahore Zoo. A Steppe Eagle in Lahore Zoo. + Grey-headed Fish-eagle, I. ichthyaetus A dark individual of the Short-toed Eagle. A dark individual of the Short-toed Eagle. * Arabic world. Many Arabic states and organisations use eagles as symbols, e.g. the PLO. * Czech Republic. The Czech Republic integrates three historical parts: Bohemia (with a double-tailed lion in the emblem), Moravia and Silesia (both with female eagles in their emblems - red-and-white chequered and black). * Hellenistic Egypt. The Ptolemaic rulers of Egypt used it as their seal. * First French Empire. Napoleon Bonaparte used the Roman Golden Eagle as the symbol of his new French empire. * Ghana. Two eagles are part of the coat of arms of Ghana. * Mexico. The bird on the Mexican coat of arms and flag is a Golden Eagle. * Moldova. An eagle is part of the coat of arms and flag of Moldova. * The Philippines. The endangered Philippine Eagle is the national bird of the Philippines. * Poland. A white eagle on a red field is the coat of arms of Poland. * Rome. The Romans used it on the standards of their armies. From this derives: o The late Byzantine Empire) chose a two-headed golden eagle as its symbol. It is popularly that one head symbolised ancient Rome, and the other head symbolised "new Rome" at Constantinople. From this derives: + Albania. The two-headed eagle is the emblem of "Shqipëria" or Land of the Eagles, which is known in English as Albania (see The Tale of the Eagle for the legendary origin of the name) + Russian Empire. After the fall of Constantinople, the Russian Empire took the two-headed eagle as its own symbol. o Charlemagne and Holy Roman Empire. After his crowning as the new Roman Emperor, Charlemagne adopted the ancient Roman eagle as his own symbol. The Holy Roman Empire born of his kingdom took the eagle, but the Habsburgs replaced the golden eagle by an imperial eagle. From this derives: + Austria. The Austrian Empire had a two-headed eagle as its symbol. After the abolition of Austria-Hungary, Austria took as its symbol a one-headed eagle in the modern coat of arms of Austria. + Germany and Prussia. Prussia, and later Germany have used a black eagle as their national symbol. + Spain. The "Catholic Kings", Isabella and Ferdinand, used the Golden Eagle as a part of the royal shield. The eagle was on the Spanish shield until 1978. * Serbia/Montenegro. The Two-headed eagle is the emblem of Serbia, Montenegro, and Serbia and Montenegro. * The Seljuk Turks and Ottoman Turks used a double-headed eagle as coats-of-arms. * USA. 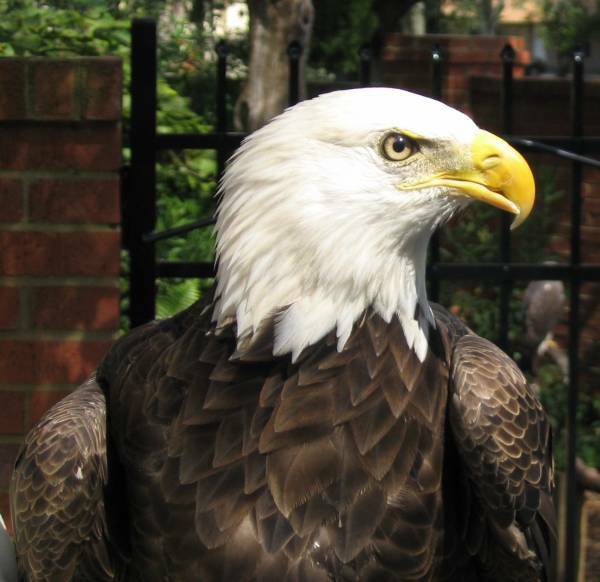 The United States has adopted the North American Bald Eagle as its national emblem. Although the Golden Eagle is found in North America, U.S. references to an unspecified "eagle" are often to the Bald Eagle, especially in an emblematic context. However, a few U.S. coins have shown the Golden Eagle (recognizable because the feathering on its legs extends to the base of the toes);  this error is the cause of the expression "illegal eagle". In Jewish tradition the eagle is a symbol of greatness, and leaders such as the medieval sage Maimonides and the Lubavitcher Rebbe, Rabbi Menachem M. Schneerson, have been referred to by their peers and students as "The Great Eagle". 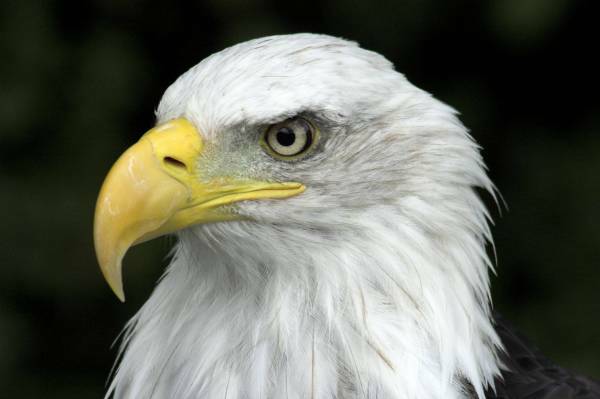 The Torah compares God Himself to an eagle in Deuteronomy, 32.11-12. "As an eagle awakens its nest, hovering over its fledglings, it spreads its wings, taking them and carrying them on its pinions. [So] the Lord guided them [the Israelites] alone, and there was no alien deity with Him." Eagle lecterns are very common in Christian churches and cathedrals. The eagle is the symbol used to depict John the Apostle, whose writing most clearly witnesses the light and divinity of Christ. In art, John, as the presumed author of the Gospel, is often depicted with an eagle, which symbolizes the height he rose in the first chapter of his gospel. Despite modern and historic Native American practices of giving eagle feathers to non-Native Americans and Native American members of other tribes who have been deemed worthy, current United States eagle feather law stipulates that only individuals of certifiable Native American ancestry enrolled in a federally recognized tribe are legally authorized to obtain eagle feathers for religious or spiritual use. * Bonelli's Eagle, the Booted Eagle and the Little Eagle have been moved from Hieraaetus to Aquila. * Either the Greater Spotted Eagle and Lesser Spotted Eagle should move from Aquila to join the Long-crested Eagle in Lophaetus, or, perhaps better, all three of these species should move to Ictinaetus with the Black Eagle. * The Steppe Eagle and Tawny Eagle, once thought to be conspecific, are not even each other's nearest relatives.